My nephew turns 14 today. Happy birthday nephew! 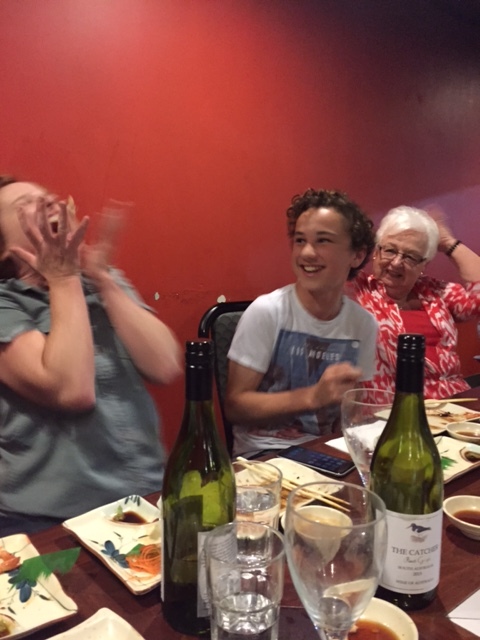 Last night was a shower of rice and fried egg kind instead as we celebrated his birthday at a local teppanyaki restaurant. I am VERY uncoordinated. 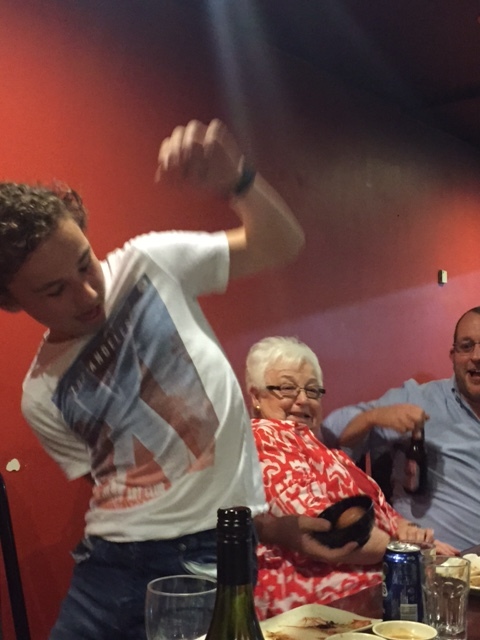 One of my dearest friend’s held her 40th birthday party at a bowling alley and my sorry attempts at bowling became everyone’s entertainment for the night. It was HARROWING. Unlike my nephew, who caught everything like A BOSS. Fortunately my offspring are waaaay more coordinated than me. The youngest’s eyes went all wide and glassy like she was on drugs when I told her we were going to teppanyaki. 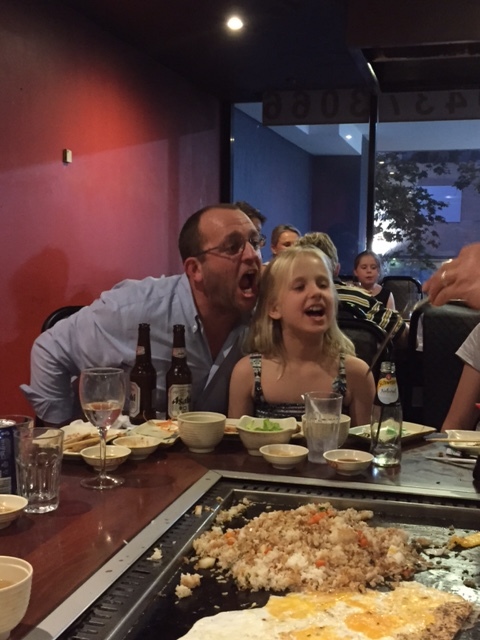 Teppanyaki is her nine-year-old version of drugs. She’s totally addicted. Teppanyaki and her COUSIN … well, that’s just an embarrassment of riches. I was sooooo tired by the time we arrived at the restaurant. My day started way too early when the eldest rolled onto her stuffed howler monkey at 4.30am. I woke with a jolt to the sound of primate wails reverberating through the silent house. As I attempted to drift back to sleep, the eldest’s latest installment of Twilight tumbled to the floor with an encyclopedia-like clunk … and I was done with sleeping for the night. Sob. Yet a whole day of working a parenting and partying still lay before me. Gifts for a 14-year-old are tricky things. We gave my nephew a variety of frisbees, which he and the youngest proceeded to ill-advisedly toss around the house, resulting in the destruction of a ceramic photo frame. Oooops. Then teppanyaki, a dip in my sister’s fabulous spa, cake, kisses all round and finally home. I showered the youngest at 9.30pm and tottering to bed around 10. Today dawns, packed to the gills. DD is collecting me at 9.30am for brunch with a former colleague in the city. Then I’m driving to Newcastle for my high school reunion. When I finally return, there will be no food in the house, but plenty of dirty dishes still in the sink, dirty washing still in the laundry … dirty everything really. Then the week will start all over again, with Groundhog Day-like determination. Tell me – what’s in store for your weekend? PS: I won’t be blogging tomorrow, I’m giving myself a day off as I’m ex-Sydney. I have only ever had teppanyaki once and I don’t remember eating much food because I caught nothing! We have had a crazy busy morning here we were out of the house by 715 to drop son #1 at cricket by 730 and then the twins and I to cricket 15mins away by 8am! It loomed grey and threatened rain all morning but not a drop until we got back in the car at 1145! Home now I am supposed to be sleeping but I have to make a cake for a family do tomorrow. So instead I am surfing the web for recipes and icing techniques! The kids want Tacos for dinner I want nothing but hopefully I can convince the 14yr old to make dinner! I will need to make the chocolate sponge and caramel filling too! The kids will probably watch Return of the Jedi tonight. Tomorrow (sunday) we are heading to my brother’s place in Mittagong. He moved in way back in February but I’ve been sick all year and my kids all do saturday sport and dance it is too bloody hard to get there. We are celebrating that my eldest nephew is still here 5yrs after his terminal brain cancer dx (we know it will come back at some stage but when no-one knows) and as a result of his treatment he has to have Hgh needles so he grows and today is his 1000th needle!!! Hence I am making the caking because a) our son is coeliac so it needs to be gluten free and b) I pretty much have always had the cake making job in the family! I am hoping to get a square chocolate sponge made with a caramel filling then covered in a piped buttercream in blue and white (Bulldogs fan!) But we will see!! Sounds like a whole heap of fun despite the fatigue and the co-ordination. My weekend was supposed to include a hen’s night and a farewell get-together and I failed at both of these. Heat stroke from my run meant that I spent the day on the couch nursing a vomit bucket and watching recorded TV. Nowhere near as much fun.